Sufi Guru Anand of Indonesia is a man of God destined to play an important role in building a world, which is free from malice, hatred and turmoil. He is a Bodhisattva (awakened being), who carries further the noble eight-fold Path of the great Buddha, as a message for salvation of human misery and pain. He advocates the greatest principle of Sufism, Ishq-i-Allah, which means that God is Love. To him a church, a temple, a mosque or a synagogue are all the abodes of God. For him, the whole mankind is one, which lives under the same sky. To him all religions come from the same source, meant to bind the human souls and not to disintegrate them. Like Jesus, the Prince of Peace, Sufi Guru Anand of Indonesia, has a passion for promoting peace and love among various peoples. From his childhood, he was brought up under the influence of the Sufi thought, because his elders had originated from Sindh which is a land of the Sufis like Bulay Shah, Bahu Sultan and Shah Latif. Later in life, he underwent various Kriyas (yogic exercises) and Chillas (sufi discipline) under several yogis, masters and murshids (sufi mystics). However at the age of 35, he had an encounter with death and that extraordinary accident changed his life from a materialist to a spiritualist. In his apparent experience of death, he had covered a journey within, which made him into a reliable guide, friend and philosopher. Since then, he has authored about one hundred books in English and the Indonesia Bahasa (language). The spiritual healing and meditation centers established by him in Indonesia have done commendable work in awakening human spirit and consciousness. Sufis of all ages, during the course of history, have tried to awaken God in the hearts by self realization. All the virtues of life like compassion, love, toleration, sympathy comes within the tuning of the heart. This is an important work, which Sufi Guru Anand has undertaken with great success. It is a great pleasure for me to have the Darshan (meeting/seeing) of this great saint of the century. His aura depicts a powerful light and his face brings joy and bliss. I wish him to live long in the service of mankind. *Most prominent Kashmiri writer, Sufi Mystic Prof. Fida Hassnain is the recipient of several awards and degrees from various institutions in India and abroad. Considered a world authority on the subject matter of this book, he has written several books on the same, which have been translated into Spanish, Italian, Polish, and Japanese. He started his career as Professor of History & Civics in the year 1947. 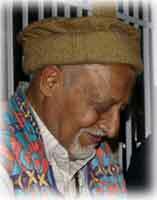 In 1953 he joined Jammu & Kashmir State Government service. Before retiring in 1980, he held several important posts, such as that of Director of General Records & Archives; Director of Archives, Archaeology, Research & Museums; and State Editor of Gazetteers of India.